SQLTest is an easy-to-use tool to generate real-world workload for testing. It can be used on-premises as well as in the cloud. Ceck out our SQL Server Performance Tuning Hands-on Video Tutorials via YouTube. SQLTest simulates the bottlenecks - you can practice to resolve them while watching the videos! No registration needed. Most of the videos are now also available on MSDN Channel 9. SQLTest can generate SQL Server database calls very similar to the actual application. Once test cases are configured, utilizing parameterization and value substitution functionality, the tests can be dynamically scaled to simulate any number of users or transactions. SQLTest can be used for SQL Server performance and concurrency testing to measure response times and to analyze locking and deadlocking issues. Attend one of our upcoming SQL Server Performance Tuning Hands-on Workshops and receive a complementary 1 Year SQLTest Professional License! • 4 to 16 workloads per instance, up to 255 connections per workload, up to 1024 threads per connection. • Easy-to-setup parameterization and value substitution functionality for dynamic load scaling. • XML Reports with various level of statistics, logging and email with attachments. • Save test configuration to file and database. 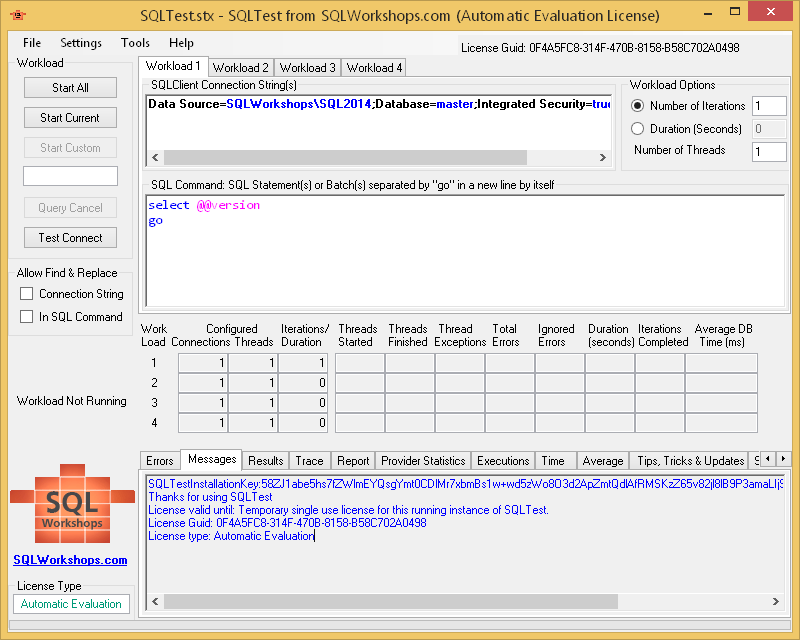 • Drive and control test execution from SQL Server with “Server Driven Test” functionality. • Thread level iteration and command settings with “Server Driven Workload” functionality. • Evaluate response time, errors, results, checksum and records affected with “Unit Test” functionality. • Find and Replace support for connection string and SQL command. • Possibility to ignore certain errors at workload or thread or database call level. • Transaction support, can also be used to rollback changes made during tests. • Possibility to add fixed or random think times before database calls to emulate realistic load. • Synchronization of database calls across workloads. • ToolTip and F1 or online help for controls with examples for easier usage. • Generate highly concurrent workload to detect scalability, locking and deadlock issues. • Compare old and new hardware platform from performance perspective before upgrade. • Measure response time of database calls before going live with a database application. • Compare Azure SQL Database Service Tiers for performance from your application workload perspective. • Create & run unit tests to verify performance and functionality, part of agile software development process. • To build a Proof-of-Concept (PoC) of your database application. • Test mission critical database applications before going live with real-life load. You do not necessarily need to register and request a license in order to try out SQLTest. If you have internet connection, after start, SQLTest will right away fetch an "Automatic Evaluation License". You can download SQLTest here. Supports all x64 Windows Operation Systems, both Desktop and Server with .Net Framework 4.0 installation. We would like to thank everyone who took the time to test the beta version and give us feedback; We would like to especially thank Jameel Ahmed, Microsoft Certified Master and Premier Field Engineer, Canada, for the enormous effort he has put in testing.